Hello, there! Yesterday we were happy to visit with Chapman Murphey, Aloha, Aloha! He’s been in mainland Mex for the spring and shared awesome stories of riding incredible waves on the Pendoflexes that Steve built for him. In these three photos below, he is riding the Pendoflex Step Off. 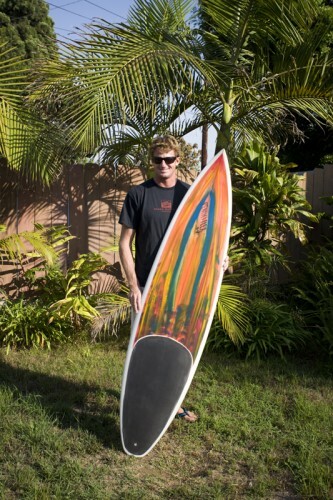 Chapman is 6′6″, and “Chap Step” is 6′5.5″ x 18-3/8″ with a rounded diamond tail and quad fin set up, with special stiff flex. This spring, Chapman was also riding a 7′2″ Pendoflex quad gun and paddling into the knarly barrels, we’ll post some images of his epic rides on this board soon. Chapman with the Pendoflex step-off "Chap Step"
3 Comments on "Chapman Pendoflexing mainland Mex"
Remember when even I was taller than Chappy. He is charging and making PL proud! Thanks Steve for the great boards you’ve been making, it has been a wonderful experience riding them. The amount of speed you can get out of the boards with minimal effort makes them perfect for driving through barrels . Steves shaping is so accurate that he can shape any board and then adjust the amount of flex to the riders need. This is where I noticed the difference, when we went from the standard flex about five years ago too this stiff flex, which works really well in handling a more powerful wave. Aloha and full flex. Oh Yeh, can’t wait till he chops out the first tow board! Chap, How’s the Hot Springs doing with the saline soulution, make sure you have that shot with Rickie. Oh, yeah, 8.4 to you, too! hahaha!